At the night before flying to Tasmania, I didn't sleep well. The main reason is I didn't put all my luggages in the lockers but in the room. "Trust and Safty" is an important issue when you travel alone in a strange country. Could you trust anyone you meet at the first time? Yes, or No? That is not an easy choice. Therefore, I'm a little nervous when I sleep with all my luggages in the room just for saving some money. I've spent too much on resotring my luggages. Although I've made an itinerary for the journey in Australia, I would change the attractions I will go just according to the information I collected somewhere. That's why I love to travel alone. If I don't like shopping, I don't have waste my time and go anywhere as I wish. Featherdale Wildlife Park is such a case that is not included in my itinerary until I saw some articles which recommend this place before I came to Australia. 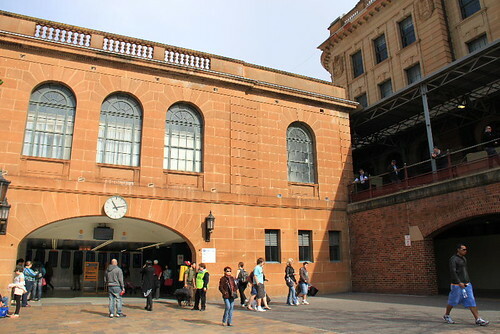 Otherwise, maybe I will go to Taronga Zoo where is close to Sydney downtown. 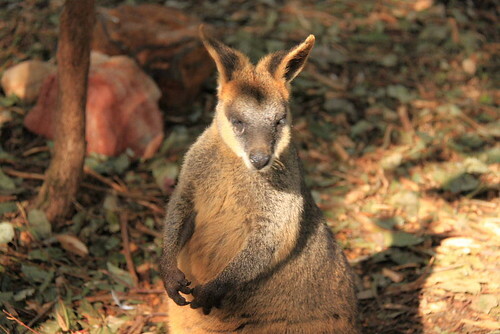 Actually, in my first plan, I seems to miss the zoo until my colleague reminds me to watch the Koala and Kangaroo. Why do I forget this? I think that is due to Lone Pine Koala Sanctuary in Brisbane which is my first choice for visiting the zoo. However, I skip Brisbane for the time and season issue, so I also forget to find another zoo. Six o'clock in the early morning, the sky is still dark and there is an hour before the sunrise. 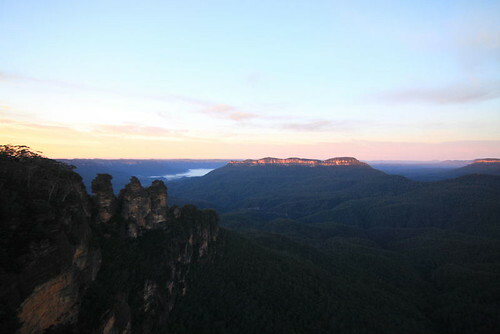 I walk to the Echo Point for the second time to watch the sunrise of Three Sisters. Sunrise or sunset is not only a moment in a day, but a serial of time. 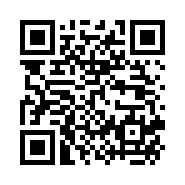 Thus, you have to wait and watch the slight differences of the light and shadow. So I stay at the Echo Point for at least thirty minutes. But I have to say that, the sun and the Tree Sisters are at the same direction in the morning, so it's not a good time to take a good photo of the Three Sisters. The sunset of Three Sisters is much better than the sunrise. Blue Mountains, is an attraction tourists will visit as they travel in Sydney. There are also some day tours that depature from Sydney in the early morning and come back in the late night, but I don't like to join such tours unless I could not handle the transportation such as the tour of great ocean road in Melbourne. 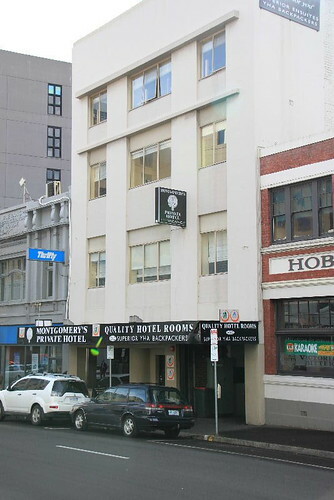 Therefore, I arrange one and half days staying at Katoomba and come back to Sydney in the early evening or night on the second day. I think I could look around here freely, and maybe have a long walk with many beautiful scenes. In the very early morning today, I store my luggages in the Sydney hostel and go with my backpack and camara bag. Because I'm not familiar with the oubound train, I stay at the wrong platform until 10 minutes before the departure time. 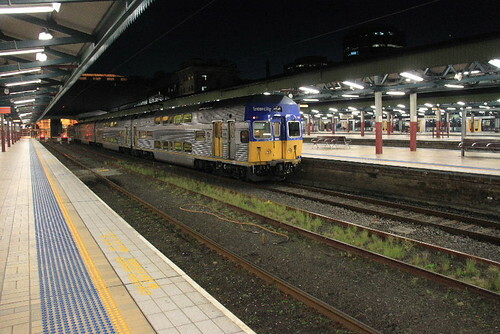 At 6:30, the train to Katoomba departs from the 12th platform. 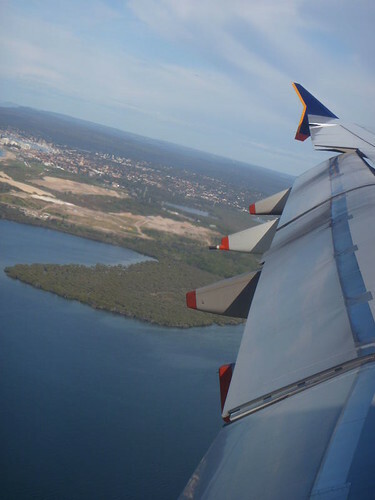 Sydney, my first stop in Ausltralia. The weather here is not so cold as I think. Maybe I look like a middle-age man or I already have ETA and some stamps from other countries, I only wait for my luggage for a while, and then pass the gates without too much inquiring and inspecting. 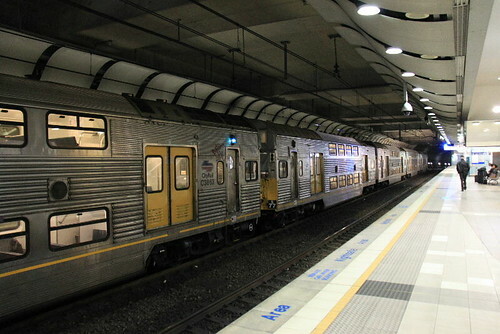 Just like the Heathrow airport of London, you could take the train from the Sydney airport directly to the city center. The design of the train is interesting. It's a two levels cabin with some seats in the middle level connecting the upper level and lower level in front and back of the cabin. So, the train could carry more people but also prvide the conveninece for the elders and the disables. I always forget the feeling of travelling as I keep living quite boringly in my city too long. The time I finished one travel in a country is also the time for preparing the next trip. I would like to spend a lot time to prepare everying well just one month before I departure or earlier.